Each month, our #LawtonPS Child Nutrition team selects an employee that has been nominated by their co-workers or manager for being caught doing something that is above and beyond normal daily expectations and contributes to the overall dining experience of our customers. They call this a Sodexo Experience! October's Sodexo Experience winner is Camina Beartrack. Camina joined LPS in 2004 and for the past 13 years has served many meals and lots of smiles. Camina was nominated by her Cafeteria Manager, Bernette Suttles at MacArthur High School. Ms. Suttles shared that she nominated Camina because she has learned all the jobs in the kitchen and cheerfully helps out everyone when she has completed her own work. She has also bought several students lunch when they had no money but were hungry. Some days Camina will cook food from home and bring it to her co-workers to enjoy after her day of work is done. 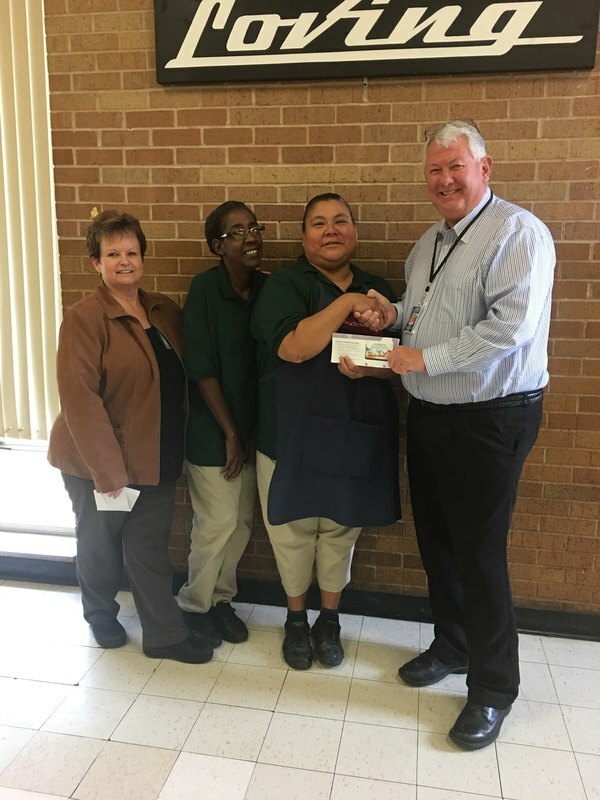 Pictured is Barbara Snow, Area Manager, Bernette Suttles, Cafeteria Manager, Camina Beartrack and Steve Dyer, GM of Lawton Public Schools Child Nutrition Program.